This cassette is cold as hell. 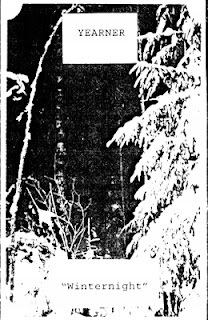 For that reason, I think this work might be fitting for the term "winter synth" as well as "dungeon synth," even if it is not quite as minimal and nature-focused as the works in the former category. Despite its obvious themes on winter, it still feels more like observing a biting-cold landscape from within the similarly freezing tower, where a weak fire provides you with just enough warmth to live; by this metaphor I mean that the style of composition rarely descends into pure repetition, droning, and sound effects, as most of the "winter synth" albums tend to, so musically it is perhaps more firmly in the ds category. Anyways, this is not too important. What matters is the effect that the music creates. It is extremely lo-fi, with vintage synths, xeroxed cover art, and, most noticeably, a very crusty recording quality. This tape feels like something one might discover buried under the snowy ground, deep in the forest and surrounded by overgrown runes. It is resistant to appreciation due to the recording quality, repetitive and primitive melodies, and the track "Obscurity," which seems to be pure dissonance. This feels to be representing the harshness of a northern winter, the easy death if one were to lose their way. But like a northern winter, there is a grim, fearful, and awe-inspiring beauty about it, in spite of (or perhaps because of) the harsh distance between the man and the icy forest, the listener and the snarly lo-fi synth cassette. Winternight pushes you away. It resists interpretation, it resists the visceral comfort of good production, it even resists a consistent and relaxing listen. Under normal production values these melancholy melodies of stoic fate would be lush and beautiful, and so they still remain, but as the tape hisses at you, it's more like being in a blizzard and seeing a noble wolf walking alongside a mountain in the distance; it would be glorious, if not for the distracting threats of the surrounding icy chill and the creature itself. To be more specific about the music itself, the closest comparison might be Hliðskjálf, though that's a bit of a stretch. There aren't any particularly realistic tones here, mostly just strong, shimmering synth tones, crunchy in some places, ethereal in others, but still sounding distinctly dungeon synth. It's about twenty minutes long, with a few-minute interlude of dissonance in the middle of the five tracks. On a more critical level, despite this work being very good, it’s not as great as his latest Til Det Bergens Skyggene release, Vandringen I (Skoglandskap). I think the lo-fi quality of the tape and the dissonant track distance the music a bit too much for my tastes. Naturally I think there's a line for how far the lo-fi effect should go, which is like anything, such as reverb or bass volume. The amounts work differently depending on the music. Here, I think it's right about on the line, where the recording quality starts to define the work without ruining it (and by define, I mean contribute a large amount of the aesthetic meaning, where it would mean something quite different without it), although in this case I think it goes slightly over, and the work would've benefited from a somewhat clearer production. Anyways, this is still a very powerful release, definitely on the upper end among the various works in "the list." A powerful and unique vision, and though challenging, it's rewarding. Winternight can be purchased here. Adding this to my list. Thanks for the heads-up! Interesting label, just ordered their discography, we'll see how that turns out. My copy arrived today! Such an atmospheric release, the degraded sound quality adds a real melancholic feel. And it's not over-long either, which is always a plus in my book. Musically, I don't think it qualifies for inclusion on my Winter Synth list, but I reckon it's a fine (if rather unique) example of obscure DS. Hey guys. I'm glad you liked the review and looked into his material. Balbulus, I'm actually happy to hear you don't think it's quite winter synth; I very much disliked the idea of encroaching on your territory so early in your blog's life. I wouldn't worry about "encroaching on my territory"; as you may have noticed I haven't been very active on my blog recently. Hopefully I'll pick it up again soon. Personally, I feel our "territories" have so many overlaps and grey areas that maybe one combined blog would suffice. In other news, I've just treated myself to all of the Til Det Bergens Skyggene releases. Absolutely fantastic, a real master of the genre. Thank you for bringing it to my attention! Great to hear the TDBS releases are now more readily available! Will definitely be planning to purchase them along with Yearner when I can.